'He changed the way villains were portrayed' Jump to media player Film critic Jason Solomons pays tribute to the actor Alan Rickman, who has died at the age of 69. Gambon remembers Potter co-star Rickman Jump to media player Alan Rickman, who played roles ranging from the villain in Die Hard to Severus Snape in Harry Potter, is remembered by his friend Sir Michael Gambon. Winslet and Rickman on 'A Little Chaos' Jump to media player The last time Alan Rickman and Kate Winslet worked together was 20 years ago in the film Sense and Sensibility, now they have been reunited for another period drama. 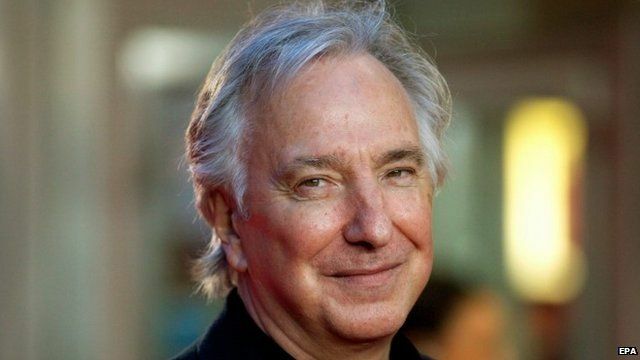 Film critic Jason Solomons pays tribute to the actor Alan Rickman, who has died at the age of 69. Rickman became one of Britain's best-loved acting stars thanks to roles including Professor Snape in the Harry Potter films and Hans Gruber in Die Hard. His family confirmed that he had been suffering from cancer.